Known in development by its codename ‘NX’, the Nintendo Switch – the 7th major video game console developed by Nintendo – was unveiled in October 2016 and released worldwide on 3rd March 2017. In the first four months after its release, the Nintendo Switch sold 4.7 million units globally, making it the fastest selling console in history. The Nintendo Switch is considered a ‘hybrid’ console in that it is designed primarily as a home console unit, but it can be removed from its docking station and turned into a portable console, or placed in tabletop mode to make it visible to several players – hence the name ‘Switch’. 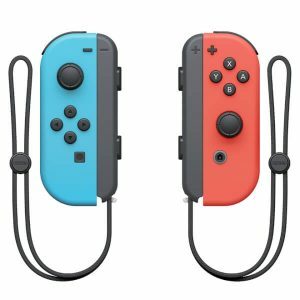 Use one or two Joy-Con controllers, vertically or sideways, through motion control or buttons…the options are almost endless! The Nintendo Switch with Joy-Con provides you with total game play flexibility. The options for the Joy-Con controllers are almost as endless as the range of games available at your favourite CAD casino! The HD rumble feature of the Joy-Con makes gaming even more immersive. Imagine your Joy-Con as a glass. With HD rumble, you can feel the difference between adding ice cubes to the glass – a stronger rumble – and pouring water into the glass – a gentler rumble. This sense of touch goes far beyond mere vibrations, and you’ll have to experience it for yourself to fully appreciate it. The IR Motion Camera based in the Right Joy-Con controller can detect the shape, movement, and distance of objects captured by the camera, which makes many new gameplay experiences possible. You can start a gaming party, anywhere, anytime with multiplayer games for the Nintendo Switch by using additional Joy-Con controllers, Nintendo Switch Pro Controllers, or a combination of the two. You will be able to compete against friends or teams at home, play online with other Nintendo Switch gamers, or link up to eight Nintendo Switch systems to play anywhere. You can manage how your family interacts with the Nintendo Switch by using the Parental Controls, and keep the focus on fun as opposed to things your kids shouldn’t be seeing. The free app provides you with even more choices as well as handy way to manage your Nintendo Switch parental controls from anywhere via your mobile device.